Warm 2 of the cups of milk with 2 tablespoons of sugar and ground cinnamon. Add the oatmeal and let it boil for approximately 3 – 5 minutes. Cut the papaya, pineapple, cantaloupe, strawberries and oranges. Arrange the fruit on a plate. Use the blender to prepare a juice with any remaining or extra oranges and strawberries. 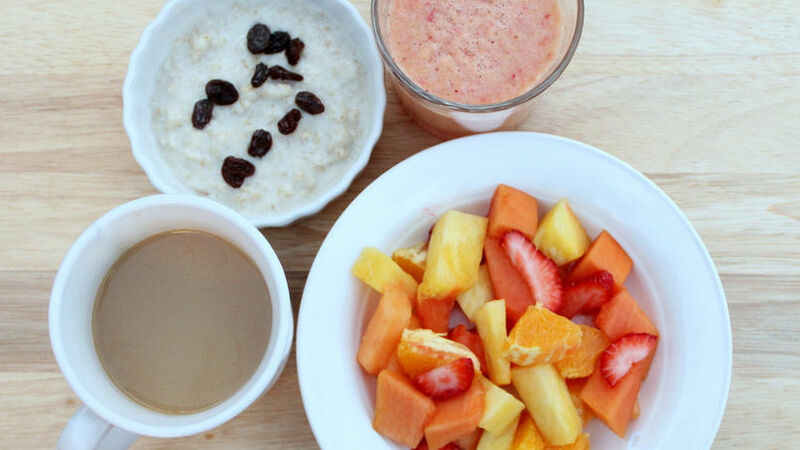 Add raisins to the oatmeal as decoration and serve it with the fruit plate, the orange and strawberry juice. Serve with a cup of café con leche. Breakfast is the first meal of the day, and as such I like it flavorful, and at the same time, energizing enough to get me going with my daily activities (especially now that the kids are back in school). We never leave the house without eating breakfast, and when I know the day is going to be extra hectic I make sure to leave enough time to fuel up on the right foods. This Creamy oatmeal and fruit recipe is the kind of whole grain breakfast that I like to enjoy and, best of all, it takes little time to make. Enjoy your breakfast!